Treat yourself to three days of drawing and painting from the life model in our lovely Artizan St studio. This course, now in its twelfth year, is ideal for all levels of ability with practical demonstrations, one to one assistance for beginners and advice for those with more experience- you can take the class to your own level. Over the course of three days you will be guided through from the basics of life drawing into composition, using tone and then into colour, moving from acrylic into oils. The course will provide all the basic skills you need to draw and paint from the life model- with a clear progression in your understanding and skill. The class is friendly and relaxed, with a mixed group of like minded participants and will really give you the chance to develop your drawing and painting skills. This summer school is perfect for portfolio building, utilising a wide range of styles, approaches and materials- you will produce a variety of work. 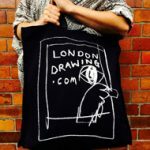 The perfect life drawing and painting course!